I received my Pottery Barn catalog this week and I went through it last night in bed and drooled over a lot of stuff this issue. Why can't I be super rich? If I ever win the lottery I'm going on a Pottery Barn binge. I swear angels started singing, my heart raced and I started babbling something and Will turns his head and says, What the hell is wrong? So really I think I got a little crazy eyed! You all know I love glass. 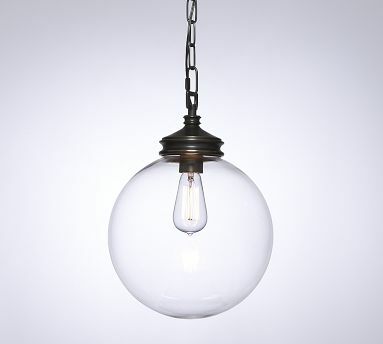 And the simplicity of the fixture is so clean and neat. But really what grabbed my attention is I have a necklace pendant that was my great grandmothers and it is eerily similar in design to this pendant. Anything that reminds me of her makes me happy! So here's hoping that I can save some quick money and get this bad boy in the new house when we move. I'm thinking Foyer. We've had a few showings this week and one family has been back 3 times to see our house, so fingers crossed! I'm really tired of keeping everything neat as a pin!